Worm infections in dogs are a common affliction. Petmectin Plus is classified as an anthelminthic (or “dewormer”). Worm infections in dogs are a common affliction. Petmectin Plus is classified as an anthelminthic (or “dewormer”). It contains three active ingredients: Praziquantel, Pyrantel Pamoate, and Ivermectin, each of which serves its own unique purpose. 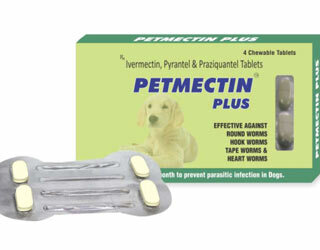 Ivermectin kills the immature form of heatworm; pyrantel pamote hookworm and roundworm; and praziquantel kills tapeworms. Petmectin Plus Chewable Tablets are recommended for dogs 8 weeks of age and older. Chewable Tablets are recommended for dogs 8 weeks of age and older.